This study presents a first, national scale approach on ecosystem condition assessment for Greece, through integrating the available surveillance and monitoring data for habitat types, at the plot level, within the Natura 2000 network. The study consists of two parts: (a) ecosystem condition assessment for ecosystem types in Greece, using the conservation degree at plot level as an indicator and (b) a large scale analysis of the forest types' condition using, as indicators, the pressures and typical plant species richness, as an exemplary case to interpret the outcomes of the assessment. The main results of this study revealed that: (i) the majority of the ecosystem types are in above good condition, with the higher percentages of bad condition recorded for wetlands, rivers and lakes, marine inlets and transitional waters, (ii) forest categories in their majority are at above-adequate condition, (iii) at forest ecosystem categories specific pressures (e.g. grazing, cultivations, forestry clearance) act as main drivers forecosystem condition change, (iv) Mediterranean deciduous forests are the most floristic-rich forest category, regarding typical plant species. Simultaneously, it is highlighted that already available datasets could be used for immediate and rapid framework assessments, which will guide future steps on ES studies, research and decision-making. The diverse Greek landscape and its biological assets, provide a variety of relevant ecosystem types, which in turn support the actual and potential provision of ecosystem services (ES), that are essential for sustaining human welfare ( Perring et al. 1992 , Daily 1997 , Cardinale et al. 2012 ). Following modern approaches on environmental management which highlight ES importance (e.g. de Groot 1992 , Daily 1997 , Costanza et al. 1997 ) and in line with the Millennium Ecosystem Assessment ( Hassan et al. 2005 ), EU included and prioritised the ES concept under Action 5 of Target 2 of its Biodiversity Strategy to 2020 ( European Commission 2011 ), calling on Member States to Map and Assess the state of Ecosystems and their Services (MAES). Since 2014, the implementation of MAES in Greece is included in the Prioritised Action Framework ( Hellenic Ministry of the Environment, Energy and Climate Change 2014a ) for the Natura 2000 sites and as an obligation of the National Biodiversity Strategy ( Hellenic Ministry of the Environment, Energy and Climate Change 2014b ). In Greece, in accordance with the provisions of Article 11 of the Habitats Directive (92/43/EEC) and in the framework of the project «Surveillance and Assessment of the conservation status of habitat types of community interest in Greece», the conservation status assessment of all habitat types was carried out with extensive field campaigns to collect data (2013-2015). Thus, a variety of detailed and geo-referenced data is available. However, until recently, the capacity of the relative state administrative units, as well as of the scientific staff, was unfamiliar with the ES concept, as proposed by the European Biodiversity Strategy 2020 ( European Commission 2011 ) and thus could not use these data for integrated ES assessments. To overcome this shortcoming, the Hellenic Ecosystem Services Partnership (HESP), came up with a first approach of the MAES conceptual framework and since then an action plan guides the production of a set of national ecosystem type and condition maps ( Dimopoulos et al. 2017b ). Following this action plan, which prioritises biophysical assessment and mapping in 2018 and 2019 and by using the guidelines given in the analytical framework for mapping and assessment of ecosystem condition in EU ( Maes et al. 2018 ), we conducted (a) a national scale assessment of the ecosystem types' condition in the Natura 2000 Specific Areas for Conservation (SACs) in Greece, based on recent monitoring data for habitat types ( Hellenic Ministry of Environment and Energy 2016 ) ( Fig. 1 ) and (b) a large scale analysis of the forest types' condition. Forest types were selected as being the predominant habitat group in Greece (forest habitats represent 37% of the natural habitat types in Greece), where most of the recent monitoring ( Hellenic Ministry of Environment and Energy 2016 ) plots (and the relevant data e.g. pressures, species recordings etc.) have been sampled. Sample plots’ locations (blue dots) used for mapping and assessment of the ecosystem condition. 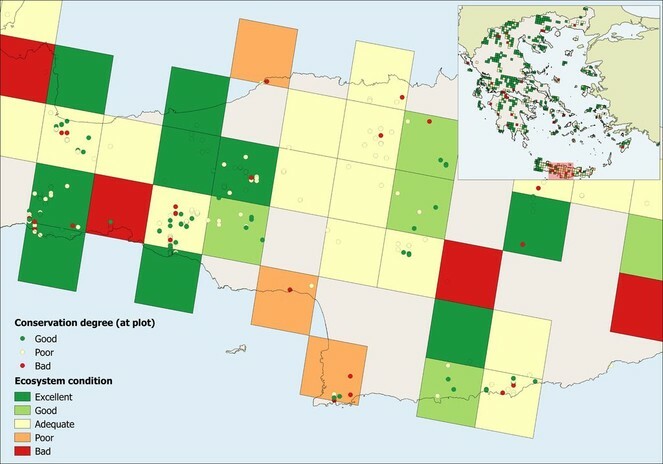 This dataset derives from the monitoring protocols collected for the surveillance and conservation status assessment of habitat types in Greece ( Hellenic Ministry of Environment and Energy 2016 ). Assessing and mapping ecosystem condition is one of the core objectives for the implementation of any MAES related study at every scale (i.e local, regional, national), because it represents both quality and biophysical state measures that are required to assess the capacity of the ecosystems to generate services ( Bordt 2015 ). The fifth EEA (European Environmental Agency) MAES report ( Maes et al. 2018 ) proposes an analytical framework on how to approach the "ecosystem condition" idea. In this report, ecosystem condition refers to the physical, chemical and biological condition or quality of an ecosystem at a particular point in time and embraces legal concepts (e.g. conservation status under the Birds and Habitats Directives, ecological status under the Water Framework Directive and environmental status under the Marine Strategy Framework Directive), as well as other proxy descriptors related to state, pressures and biodiversity. explore and interpet the relationship of the forest categories condition to the recorded pressures and typical plant species diversity (national scale approach within the forest categories). The present study and the assessment presented in Kokkoris et al. (2018) are considered as initial steps needed for the MAES implementation in Greece, to move forward with operational integrated MAES studies, as described in the framework proposed by Burkhard et al. (2018) . The term conservation degree is used for the conservation status assessment at local (i.e. sampling locality) or regional (i.e. Natura 2000 SAC) scale, while, at the national scale, the term conservation status is applied. This need for differentiation in the terminology has been proposed by Evans and Arvela (2011) , as well as by Chrysopolitou et al. (2015) for Greece to distinguish the assessments made at local/regional scale for the completion and/or update of Standard Data Forms, from those made at the national or biogeographical scale for the purposes of habitat types monitoring according to Article 17 of Directive 92/43/EEC. Pressures used as an indicator for ecosystem condition represent past and/or contemporary ongoing impacts that cause a decrease in environmental quality ( Maes et al. 2018 ) and threaten the long-term viability of the ecosystem types and their habitats ( Tsiripidis et al. 2018 ). is sensitive to changes in the condition of the habitat (“early warning indicator species”) ( Evans and Arvela 2011 ). To assign each habitat type to the relevant MAES level 2 ecosystem type, we created a typology following EEA *2 and Kokkoris et al. (2018) ( Table 1 ). Hence, each habitat type has been attributed to one of the following ecosystem types: (a) grasslands, (b) woodland and forests, (c) heathland and shrub, (d) sparsely vegetated land, (e) wetlands, (f) rivers and lakes, (g) marine inlets and transitional waters. Typology of ecosystems and correspondence of the habitat types of Greece ( Dimopoulos et al. 2018 ) with the MAES ecosystem categories and types (Level 1 and Level 2). Habitat type codes of Greek interest are underlined; in bold, the habitat types assessed in the present study; asterisk (*) indicates habitat types of conservation priority in Europe. The habitat type code names are provided in Suppl. material 1 . Accordingly, all spatial data from the standardised habitat type monitoring protocols, applied at each sample plot, were assigned to the relevant ecosystem type, grouped and projected on the EEA 10 km grid. Each monitoring protocol ( Tsiripidis et al. 2018 ) resulted in a conservation degree (that incorporates typical species presence and abundance, structure and functions, presence and intensity of pressures) for each habitat type at the plot level ( Dimopoulos et al. 2018 , Tsiripidis et al. 2018 ). The condition assessment has been achieved by assigning the plot conservation degree value (i.e. Good, Poor or Bad) on a scale from 1 to 3, i.e Good = 1, Poor = 2 and Bad = 3; hence, the conservation degrees below "Good" contribute with an increased weight in the condition calculation, integrating the importance of "Poor" and "Bad" conservation degree into the ecosystem’s condition per cell. For each grid cell with available monitoring protocols, we calculated and used the mean value of the weighted conservation degree of all plots as the ecosystem condition indicator for each cell; the results of this analysis were classified according to a five-rating scale that represents the condition value for each ecosystem type at each grid cell, as follows: Excellent, Good, Adequate, Poor, Bad and are represented thematically using GIS ( Fig. 2 ). Schematic representation of the methodology used to assess the ecosystem condition in each cell (snapshot from the woodlands and forests assessment). Cell colours represent the ecosystem condition as the mean of all plot values in the cell. Based on Tsiripidis et al. (2018) , we calculated a pressure Shannon/index as the numerical expression of quantity and intensity of all pressures recorded at each grid cell. In each sampling location, the occurrence and intensity (low, medium, high) of pressures and threats was assessed by means of expert judgement from the field researchers. Field researchers used the standard list of pressures and threats found in the reference material for the reporting period 2007-2012 under Article 17 of the Habitats Directive *3 . For each recorded pressure and threat in each sampling location, the value of 1, 2 or 3 for low, medium or high intensity, respectively was assigned. The final ‘pressure Shannon/index’ value was derived by summing the individual values of pressures and threats in each sampling location and then averaging these values at the level of grid cell (in each grid cell, a number of sampling locations can occur). The ‘pressure Shannon/index’ was finally expressed in a six-grade effect scale i.e. 0: No pressures, 1: Very low, 2: Low, 3: Medium, 4: High, 5: Very high. To interpret and exemplify the condition results in the forest ecosystems (i.e. "woodland and forests" MAES level 2 category), we assessed for each forest category present in Greece ( Table 2 ): (a) its present condition, (b) the pressures applied and (c) its typical species richness. The aim of this interpretation assessment was to identify possible correlations and overlaps amongst the conditions of each forest category with the pressures applied and the typical species richness. 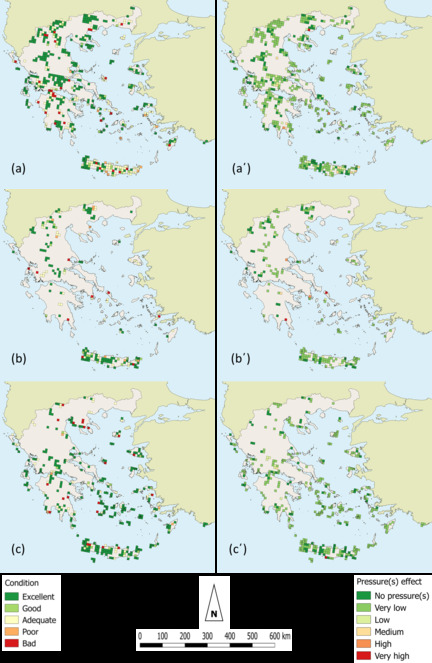 Forest categories and types of Greece ( Dimopoulos et al. 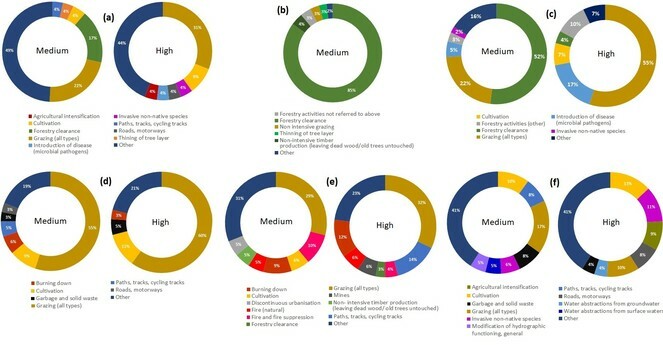 2014 ) in correspondence with the assessed habitat types; the habitat type codes of Greek interest are underlined; asterisk (*) indicates habitat types of conservation priority in Europe. Applying the same methodology, as previously described for the ecosystem types, we produced ecosystem condition maps for each of the six forest categories present in Greece. This aims to identify the spatial patterns of forest categories' condition ranging from excellent to bad. To identify, document and interpret the different ecosystems' condition, resulting for the forest categories, we determined the percentage share of the pressures recorded in the Natura 2000 database ( Hellenic Ministry of Environment and Energy 2016 ) at each forest category. The analysis was based on recorded pressures of high and medium importance; pressures of low importance have been excluded from the analysis. The assessment of pressures was used, due to their importance as indicators for the ecosystem condition assessment ( Maes et al. 2018 ). Species richness is considered as a structural indicator for ecosystem condition assessments ( Maes et al. 2018 ). 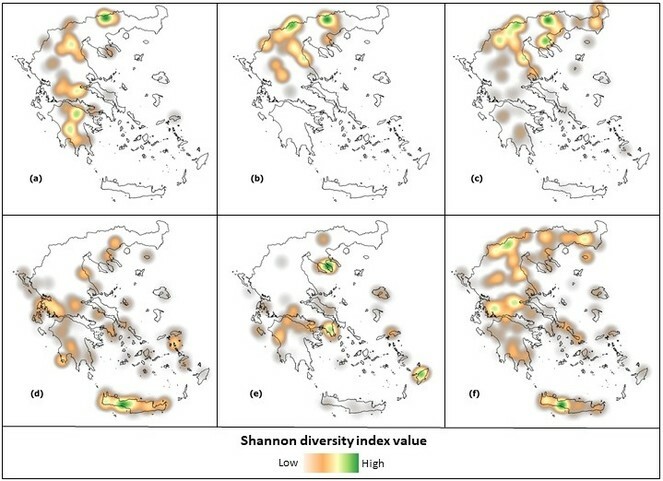 From the available habitat types monitoring dataset ( Hellenic Ministry of Environment and Energy 2016 ), which includes detailed recordings of typical species from field monitoring protocols for forest habitat types, we used the typical species richness as an indicator by applying the most commonly used Shannon Shannon/index (H’) ( van der Maarel and Franklin 2013 ) for each forest type. In order to identify the spatial distribution of typical species diversity, we created Shannon-weighted heat-maps (using a radius of 40 km) for each forest category. amongst all ecosystem types, the higher percentages of bad condition are recorded for the wetlands (20%), rivers and lakes (18%), marine inlets and transitional waters (18%). Proportion (%) of the ecosystem condition categories assigned to the ecosystem types (MAES level 2) of Greece (EEA 10 km grid cell analysis). The ecosystem condition is scaled as: Excellent, Good, Adequate, Poor and Bad. Mapping of the ecosystem types’ condition (EEA 10 km grid cell analysis) for: (a) grasslands, (b) woodland and forests, (c) heathland and shrub. Pressure(s) cumulative effect for each ecosystem type is presented in plates (a΄), (b΄) and (c΄), respectively. Mapping of the ecosystem types’ condition (EEA 10 km grid cell analysis) for: (d) sparsely vegetated land, (e) rivers and lakes, (f) wetlands and (g) marine inlets and transitional waters. Pressure(s) cumulative effect for each ecosystem type is presented in plates (d΄), (e΄), (f΄) and (g΄), respectively. the majority of the pressures' effect on ecosystem types follows a rather uniform pattern ranging from "No" to "Low" intensity. Proportion (%) of the different ecosystem condition categories assigned to the Woodland and Forest Ecosystem category (MAES level 2) in Greece, based on the EEA 10 km grid cell analysis. The ecosystem condition is scaled as: Excellent, Good, Adequate, Poor and Bad. Forest categories condition mapping based on the EEA 10 km grid cell analysis: (a) Temperate mountainous coniferous forests, (b) Temperate deciduous forests, (c) Mediterranean deciduous forests, (d) Mediterranean sclerophyllous forests, (e) Mediterranean coniferous forests and (f) Floodplain forests. Pressures' analysis provided information on the intensity and type of human impacts on forest ecosystem categories. This analysis revealed that grazing is the predominant pressure of high intensity in all forest categories, except (a) the temperate deciduous forests, where no high pressures have been recorded (forest clearance is the predominant pressure of medium intensity) and (b) the floodplain forests, where cultivation performance dominates. The pressures spectrum at floodplain forests is secondarily dominated by grazing, presence of invasive non-native species, water resources degradation and road network fragmentation ( Fig. 6 ). Schematic representation of the contribution (%) of pressures of medium and high intensity recorded at the forest categories: (a) Temperate mountainous coniferous forests, (b) Temperate deciduous forests, (c) Mediterranean deciduous forests, (d) Mediterranean sclerophyllous forests, (e) Mediterranean coniferous forests and (f) Floodplain forests. Mediterranean deciduous forests represent the most floristic-rich forest category, with the highest average number of typical plant species (13 taxa) and Shannon-diversity Shannon/index value (1.53). The Mediterranean and the Temperate mountainous coniferous forests follow, with a Shannon diversity Shannon/index of 1.08 and 1.03, respectively. The results of this analysis are summed and presented in Table 5 , while detailed information for each forest type is included in Suppl. material 2 . The equitability (evenness) Shannon/index ranges from 0.43 (Temperate mountainous coniferous forests and Temperate deciduous forests) to 0.51 (Mediterranean coniferous forests); hence no significant difference is observed in the evenness distribution pattern amongst the forest categories. Due to the evenness Shannon/index value (around 0.50), the typical species in all forest categories are moderately even in their distribution. Typical species average number, Shannon and Evenness indices for each forest ecosystem category. From the heat-map per forest category ( Fig. 7 ) based on Shannon's Shannon/index value, the geographical areas of Greece with high typical species diversity are highlighted. The highest typical species diversity is observed and spatially arranged per forest category, as follows: (a) Temperate mountainous coniferous forests: mountains of north, north-eastern Greece and Peloponnese; (b) Temperate deciduous forests: northern Greece; (c) Mediterranean deciduous forests: north-central and north-eastern Greece; (d) Mediterranean sclerophyllous forests: Crete; (e) Mediterranean coniferous forests: northern Greece (Chalkidiki), central Greece (Attica) and southeast Aegean (Rhodes); and (f) Floodplain forests: Crete, central Greece and in northern Greece. Heat-maps of Shannon diversity Shannon/index for the forest categories: (a) Temperate mountainous coniferous forests, (b) Temperate deciduous forests, (c) Mediterranean deciduous forests, (d) Mediterranean sclerophyllous forests, (e) Mediterranean coniferous forests and (f) Floodplain forests. The ecosystem services' approach via the MAES implementation in Greece is highly prioritised in the policy- and descion-makers' agenda for the environment [e.g. LifeIP4Natura *4 , lake Stymfalia ES project *5 , Natura 2000 value Crete Life project *6 , Technical guide for MAES implementation in Greece ( Dimopoulos et al. 2017a ), workshops on ES organised by the Ministry of the Environment and Energy *7 etc.]. Additionally and within the last four years (since September 2014 when Greece nominated its MAES national representative), Greece achieved the status of being amongstthe countries with the highest progress in MAES implementation (ESMERALDA Project MAES barometer *8 ). However, the lack of knowledge on ecosystems' condition under the proposed framework by EU ( Maes et al. 2018 ) postpones the implementation actions. The methodology proposed in the present study provides the advantage of a rapid assessment approach exploiting available datasets of high quality, to set an assessment baseline and trigger more detailed and disciplined specific studies on ecosystem condition indicators (e.g. for water resources, soil and air quality etc.). The results of the ecosystem types condition prioritise future ecosystem condition studies for freshwater ecosystems, since wetlands, rivers and lakes are highlighted as the most degraded; this should include local-scale assessments and the usage of indicators which can provide detailed and quantified results at a very large scale to diagnose synergies and trade-offs. Based on the outcomes of the Millenium Ecosystem Assessment *9 , the good and excellent condition of the majority of the ecosystem types highlights areas with an increased capacity to provide ES and, by this, can be characterised as ES hot-spots. The large scale analysis for the forest categories interprets the trade-offs between ecosystem quality and profits gained by the applied pressures (e.g. forest clearance to create new areas for cultivation); most pressures, even if they were recorded as of high importance, affect only locally (plot level) the ecosystem condition, since the conservation status assessment revealed that the majority of the forest categories are at above-adequate condition. This information is crucial for future ES assessments since it provides information on pressures that should be monitored in order to identify the limits of sustainable management above which the pressure would become a direct threat for ecosystems' condition and its capacity to provide ES. By this, future studies should analyse the drivers of change identified by the pressures' analysis in order to take these into account when drafting and implementing the protected areas' management and action plans. Typical species richness can be used as a good indicator for the maintenance of functional and structural characteristics of habitats types ( Chrysopolitou et al. 2015, Dimopoulos et al. 2018, Dimopoulos et al. 2014, Evans and Arvela 2011, Tsiripidis et al. 2018 ) and subsequently of the relevant forest categories; thus, heat-maps, based on the Shannon diversity Shannon/index, pinpoint areas where maintenance services are provided at various values. However, in this study, the variation of the Shannon/index amongst the forest categories is low, providing no clear information for maintenance services hot-spots. Thus, synergies, overlaps and trade-offs of the typical species richness indicator with the pressures applied and the ecosystem condition cannot be clearly identified and described by the proposed methodology, since no sound correlation is evident amongst them. This study revealed that ecosystem condition assessment is a multivariate concept which should include and unify all environmental information available for each ecosystem type; thus, it is the keystone of the whole Action 5 of the EU Biodiversity Strategy to 2020 ( Maes et al. 2018 ). This prerequisite guides ES researchers' efforts to combine different types of information and data that require standardisation, normalisation and frequently weighting for each data category; hence, the need for interdisciplinary cooperation, as well as for specialised training on ES condition and ES data management and analysis is mandatory. Attempting to propose methodologies and provide practical solutions for bottlenecks in ES mapping, the ESMERALDA H2020 project *10 organised an extensive dissemination campaign and hands-on workshops; thus, the ESMERALDA project managed to build high-level capacity on ES amongst scientists from all EU Member States. In the case of Greece, this led to large-scale projects in Natura sites (e.g. local case study at the mountainous lake Stymfalia), as well as to national-orientated publications (e.g. Technical guide for MAES implementation in Greece ( Dimopoulos et al. 2017a ) etc. 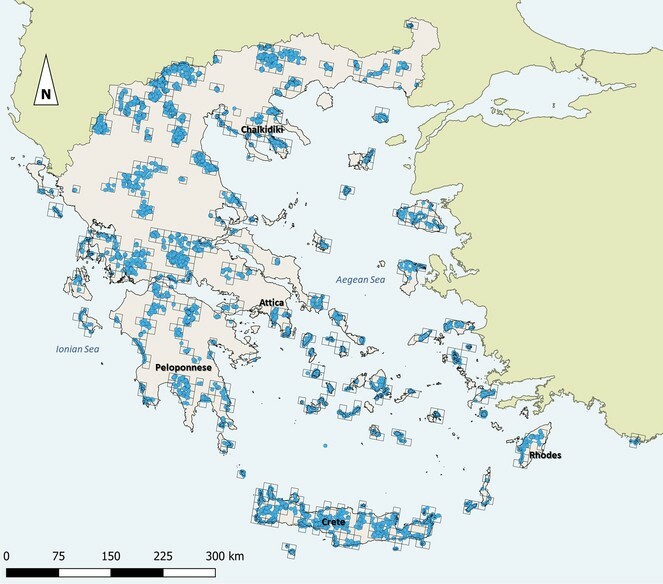 In the same direction, the most important achievement, related to the MAES implementation in Greece, is the recent approval (end of 2017) of a LIFE Integrated Project (Integrated actions for conservation and management of Natura 2000 sites, species, habitats and ecosystems in Greece); one of its main actions is to map and assess Greece’s ecosystem condition at national, regional and local scale. habitat type diversity per forest type. These structural attributes, in combination with functional attributes per plant community and habitat type on the basis of their species functional traits (e.g. dispersal mode, life-form, growth-form), are expected to provide results of high confidence to be integrated into ecosystem condition mapping and in the decision- and policy-making process. The next important phase for integrated management of species, habitat types and ecosystems within and outside SACs of the Natura 2000 network, should include: (a) scientific documentation of the ecosystem condition, (b) linkages to the established conservation objectives (down-scaled from the national to the local level) and (c) linkages to the conservation measures to be applied in the framework of management plans. This crucial stage is a real challenge for academia, decision-, policy-makers and stakeholders. The present study provides a rapid, national scale assessment on the condition of the ecosystems in Greece and revealed that the majority of ecosystems are at above-adequate condition (wetlands are mostly in adequate condition); mapping of ecosystem condition highlights potential hot-spots of ES supply. The pressures' analysis within each forest ecosystem type revealed the main drivers of change in the forest categories, while the typical species richness assessment highlighted the need for a more detailed analysis based on more integrated aspects of diversity (e.g. total species richness assessments). Regarding policy- and decision-making support, this study, complementary to the study by Kokkoris et al. (2018) , provides one of the initial steps needed for the kick-off actions of the MAES implementation in Greece; moreover, it revealed that the available data from the Natura 2000 database of Greece could be used for framework assessments and produce cornerstone results guiding future studies and ES research. Suppl. material 1: Updated list of the habitat types (Annex I of Dir. 92/43/EEC and habitat types of Greek interest) occurring in Greece (Dimopoulos et al. 2018).